Patients with diabetes are at particularly high risk for cardiovascular disease. Indeed diabetes has been appropriately described as ‘a state of premature cardiovascular death associated with chronic hyperglycaemia’.1 Recently, the European Society of Cardiology (ESC) and the European Association for the Study of Diabetes (EASD) have published joint guidelines on diabetes, pre-diabetes, and cardiovascular diseases.2 Broadly, they reflect the rigorous approach of the 2005 revised Joint British Societies’ guidelines on the Prevention of Cardiovascular Disease in Clinical Practice (JBS 2).3 In this article, we will revisit the main JBS 2 guidelines for individuals with diabetes and compare them with the recommendations from the ESC/EASD. The aim of the first guidelines from the Joint British Societies (JBS 1) was to promote a more effective multi-disciplinary approach to cardiovascular disease (CVD) prevention.4 The guidelines addressed the needs of both individuals with established disease and apparently healthy subjects at high risk of developing disease. The National Service Framework for Coronary Heart Disease (CHD) for England and Wales endorsed the lifestyle and risk factor targets in JBS 1.5 It also established national audit standards, which were subsequently reinforced and expanded by the General Medical Services contract for primary care. Since then new data have been published on blood pressure and lipid lowering in people with established disease and those at high risk; on risk factor modification in diabetes; and on the prevention of diabetes. In particular, landmark trials of statin treatment rendered the JBS 1 guidelines on lipid lowering obsolete, and lower thresholds for commencing lipid-lowering therapy were recommended by the National Institute for Health and Clinical Excellence (NICE, www.nice.org.uk). In the light of this new evidence the JBS guidelines were in need of revision. The aims of the revised guidance are broadly similar to those of its predecessor: CVD prevention for all high-risk people by reducing the risk of the disease and its complications – including the need for revascularisation procedures – and to improve quality of life and life expectancy. JBS 1 highlighted the specific problem of CHD but the new guidance encompasses the whole spectrum of atherosclerotic CVD. Since all these people have a high risk of death from CVD, especially from CHD, it is necessary to apply similar lifestyle and risk factor targets to the entire cohort. apparently healthy individuals at high risk of developing symptomatic disease, i.e. CVD risk ≥ 20% over 10 years. People in these three groups should all receive lifestyle and multi-factorial risk factor intervention to defined targets. Finally, those with a family history of premature CVD (men < 55 years and women < 65 years) should have their cardiovascular risk assessed and managed accordingly. This includes education about the disease and its complications, empowering user self-management, and the importance of concordance with treatment and clinical review. Special attention is warranted for smoking cessation, appropriate dietary choices, physical activity and ideal weight attainment (box 2). Careful explanation of the benefits of treatment and vigilance for side effects are needed to maximise patient concordance. All those aged ≥ 40 years with either type 1 or type 2 diabetes. if statins are not tolerated. Tight glycaemic control remains crucial in both type 1 and type 2 diabetes to reduce microvascular and macrovascular complications. Ideally the goal is normoglycaemia with the avoidance of hypoglycaemia. Optimal biochemical targets are HbA1c < 6.0% and fasting or pre-prandial glucose levels of 4–6 mmol/L. The European Society of Cardiology/European for the Study of Diabetes (ESC/EASD) guidelines also draw attention to the need to control peak postprandial glucose levels. Good glucose control in type 1 diabetes needs appropriate insulin therapy together with dietary and lifestyle adjustment. Rapid symptom relief may be achieved by use of twice-daily pre-mixed insulin, but good glycaemic control frequently requires a four-times-daily basal-bolus insulin regimen. thereafter, a sulphonylurea, a glitazone and/or insulin can be added in any order according to the patient’s individual need and preferences. However, the algorithm does permit some therapy combinations that are off-label or even contraindicated in some countries, e.g. a glitazone in combination with insulin. are aged ≥ 50 years, or who are younger but have had diabetes for more than 10 years, or who are receiving treatment for hypertension. Many studies have assessed the effect of a single intervention on CVD outcomes in diabetes subjects. The Steno-2 study provided striking evidence of the benefits resulting from intensive target-driven multi-factorial intervention.16 One hundred and sixty patients with type 2 diabetes and microalbuminuria were randomised to receive either conventional treatment according to Danish national guidelines or aggressive intervention targeting all risk factors. In table 2, we have summarised both the JBS 2 and ESC/EASD guidelines in Alphabet Strategy format. The debate about CVD risk reduction in diabetes often focuses on patients with type 2 diabetes. However, it should not be forgotten that people with type 1 diabetes have an even higher risk of premature CVD. Risk reduction must also be pursued aggressively in these individuals. The 10-year follow-up of the Pittsburgh Epidemiology of Diabetes Complications Study showed that blood pressure, lipid levels and concomitant peripheral vascular or renal disease were important risk factors for the prediction of CVD in type 1 diabetes.18 The JBS 2 recommendations therefore make no distinction between the interventions needed in type 1 and type 2 subjects: they are the same in both groups. The primary prevention of CVD in people with either kind of diabetes should be approached with the same urgency as secondary prevention in the general population. JDL has received educational grants and conference fees from Astra Zeneca, Sankyo and Bristol-Myers Squibb. JRM and VP have received lecture fees and conference grants from all major pharmaceutical companies including Pfizer. SS: none declared. Fisher M, Shaw K. Diabetes: a state of premature cardiovascular death. Practical Diabetes Int 2001;18:183–4. The Task Force on Diabetes and Cardiovascular Diseases of the European Society of Cardiology (ESC) and of the European Association for the Study of Diabetes (EASD). Guidelines on diabetes, pre-diabetes, and cardiovascular diseases: executive summary. Eur Heart J 2007;28:88–136. British Cardiac Society, British Hypertension Society, Diabetes UK, HEART UK, Primary Care Cardiovascular Society, Stroke Association. JBS 2: Joint British Societies’ guidelines on prevention of cardiovascular disease in clinical practice. Heart 2005;91(suppl 5):v1–52. Wood DA, Durrington P, Poulter N et al. Joint British recommendations on prevention of coronary heart disease in clinical practice. Heart 1998;80:S1–29. Patel V, Morrissey J. The alphabet strategy: the ABC of reducing diabetes complications. Br J Diabetes Vasc Dis 2002;2:58–9. Beevers DG. The end of beta blockers for uncomplicated hypertension? Lancet 2005;366:1510–12. Deedwania P, Barter P, Carmena R et al. Reduction of low-density lipoprotein cholesterol in patients with coronary heart disease and metabolic syndrome: analysis of the Treating to New Targets study. Lancet 2006;368:919–28. Nathan DM, Buse JB, Davidson MB et al. 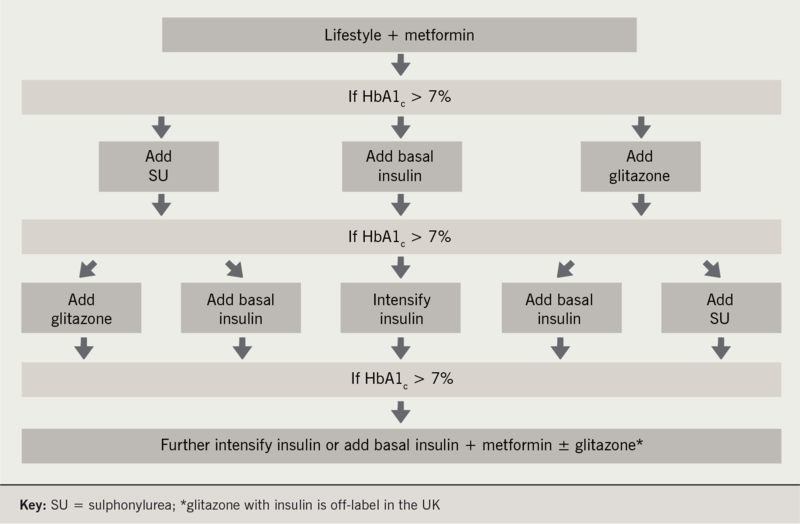 Management of hyperglycaemia in type 2 diabetes: a consensus algorithm for the initiation and adjustment of therapy. A consensus statement from the American Diabetes Association and the European Association for the Study of Diabetes. Diabetologia 2006;49:1711-21 and Diabetes Care 2006;29:1963–72. Patel V, Sailesh S, Panja S, Kohner E. Retinal perfusion pressure and pulse pressure: clinical parameters predicting progression to sight-threatening diabetic retinopathy. Br J Diabetes Vasc Dis 2001;1:80–7. Kirby M, Jackson G, Simonsen U. Endothelial dysfunction links erectile dysfunction to heart disease. Int J Clin Pract 2005;59:225–9. Lehto S, Ronnemaa T, Pyorala K, Laakso M. Risk factors predicting lower extremity amputations in patients with NIDDM. Diabetes Care 1996;19:607–12. Heart Outcomes Prevention Evaluation (HOPE) study investigators. Effect of ramipril on cardiovascular and microvascular outcomes in people with diabetes mellitus: results of the HOPE study and MICRO-HOPE study. Lancet 2000;355:253–9. Brenner BM, Cooper ME, de Zeeuw D et al. Effects of losartan on renal and cardiovascular outcomes in people with type 2 diabetes and nephropathy. N Engl J Med 2001;345:861–9. Parving HH, Lehnert H, Brochner-Mortensen J et al. The effect of irbesartan on the development of diabetic nephropathy in people with type 2 diabetes. N Engl J Med 2001;345:870–8. Gæde P, Pernille V, Larsen N et al. Multifactorial intervention with cardiovascular disease in patients with type 2 diabetes. N Engl J Med 2003;348:383–93. Jaiveer P, Saraswathy J, Lee JD et al. The alphabet strategy: a tool to achieve clinical trial standards in routine practice? Br J Diabetes Vasc Dis 2003;3:410–13. Orchard TJ, Olson JC, Erbey JR et al. Insulin resistance-related factors, but not glycemia, predict coronary artery disease in type 1 diabetes: 10-year follow-up data from the Pittsburgh Epidemiology of Diabetes Complications Study. Diabetes Care 2003;26:1374–9.